1) Internet of things trend – That anything that can be connected will be connected. This also goes for more traditional media such as TVs, outdoor signs etc. 2) Automation trend – That if something is done more efficiently by computers it will be done by computers. In the world of media, this would lead to a future where the vast majority of media is digital and accessed via programmatic buying. The good news is that programmatic isn’t that difficult. That said, you need to take the time to truly understand it if you want to make it a competitive advantage as a CMO. Programmatic buying – This is the automated buying and selling of digital media enabled by programmatic technology platforms such as for example DoubleClick. Programmatic marketing – This when you use the power of programmatic buying to be able to move more and more away from mass marketing towards one-to-one marketing, yielding a bigger impact of your marketing efforts due to more relevant messaging. One of the big benefits of programmatic marketing is relevance. With increased relevance comes greater impact and better return on investments. Programmatic marketing, moving towards relevant one-to-one marketing would not be possible at scale with manual buying, this is where technology truly comes into play. The way to think about the process to move from mass marketing to programmatic marketing is to think about audience segments. The trick with programmatic marketing is to find the balance between splitting your audience into smaller and more relevant audience segments with tailored messaging, and still have audience segments that are sufficiently big to be able to draw relevant data learnings from. 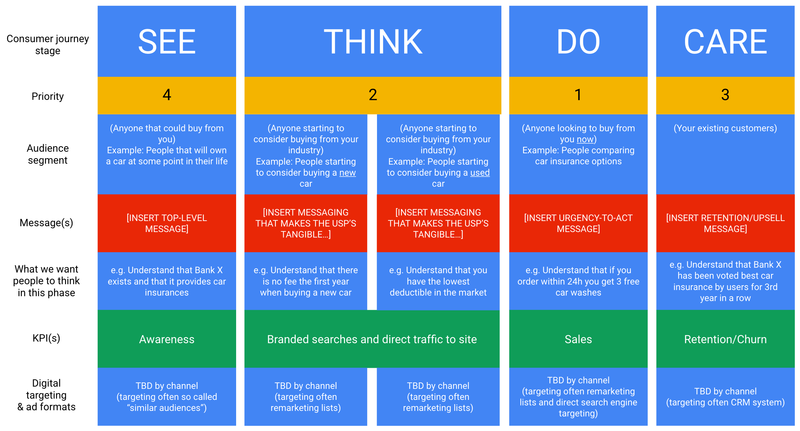 So you will not get to true one-to-one marketing since it wouldn’t be efficient to create 10 million different messages for a population of 10 million people. At the same time you probably wouldn’t go with only 3 segments either, since it would cluster people into too big groups making the messages less relevant. If you are used to working with Search Engine Marketing your job is very similar. The only difference is that in SEM you look at keywords, and in programmatic marketing you look at audience segments. Each group of keywords and each audience segment needs to both have enough volume to be able to draw data-based conclusions around what is working and not, and also be sufficiently targeted to be relevant. So how can you get going with programmatic marketing? It is critical to remove what sometimes feels like a “black box” of programmatic marketing. A way to do this is no rocket science, but to pick one (1) campaign and bring everyone involved into a room to create, execute and evaluate it all together. After you have done this everyone will have sufficient insights and knowledge of programmatic marketing to be able to scale it across campaigns without the need to involve everyone at each stage. If you do this, what today might seem like somewhat of a “black box” of programmatic technology will be removed by the exercise and all questions & answers that it will lead to, and you as a CMO will be a much more qualified customer to your agencies, partners and co-workers. So, do you understand the details of how a campaign gets executed programmatically? If not, how do you know if you are asking the right questions as a CMO?